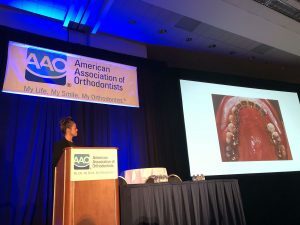 The 2018 AAO, American Association of Orthodontists held their 2018 annual meeting in Washington DC. 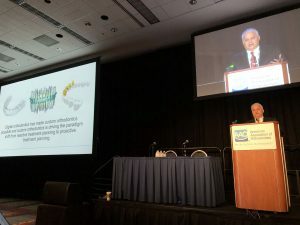 The 2018 AAO, American Association of Orthodontists held their 2018 annual meeting in Washington DC. May 4th through May 8th. Chris Riolo and Cali Kaltschmidt from Riolo Orthodontics presented 6 hours of workshops and lectures to both doctors and staff from around the world. Our Events started on Friday May 4th with 3D Printing workshops at 1:00 and 3:00. The workshops presented by both Cali Kaltschmidt and Dr Riolo were titled “From the Scanner to your Hand” and consisted of a short presentation on 3D printing technology including SLS and DLP printing. The lecture was followed by a hands on STL editing session lead the Cali using Meshmixer. Breakout groups followed, participants were assigned to 1 of 3 printing groups to print their edited dental arches. All of the participants enjoyed one on one time with Dr. Riolo Cali and the printer techs while the dental arches printed. Cali Kaltschmidt presenting her lecture on 3D printing technology and applications related to orthodontic practice. 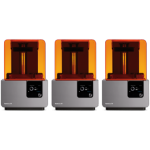 Moonray, Juell and Formlabs2 printers were available at the 2018 AAO workshops for the participants; each of the participants spend time with the printing software required to format dental arches on each of these printers. 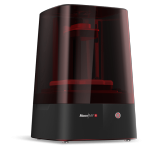 Riolo Orthodontics uses the JUELL 3D-2 is one of the fastest 3D printers available for orthodontic practices today. The JUELL 3D-2 is one of the fastest 3D printers available for orthodontic practices today. The Juell printer is capable of printing orthodontic models for complete clear aligner treatment in under 30 minutes without compromising resolution or accuracy. 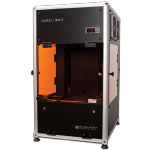 The Juell printer builds at speeds as fast as 36mm per hour with accuracy achieved by using enhanced UV/DLP/LED technology and JUELL 3D Flash OC software to project an HD image with 1920 x 1080p resolution. With the Juell printer we can print from an intra-oral or tabletop scanner using .stl, .obj, .3ds or .amf file formats. 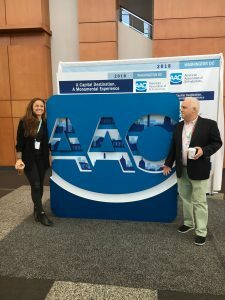 Cali and Doctor Riolo also presented a 2 hour staff lecture on 3D printing at the 2018 AAO meeting in Washington DC. This lecture covered topics ranging from 3D printing technology to editing raw STL files and digital workflow associated with “In-House” clear aligners. Cali also presented 3D printing applications associated with provisional tooth replacement. On Sunday, Dr Riolo Presented his lingual orthodontic lecture for the doctors scientific program. Dr. Riolo covered material related to custom orthodontic appliance and the impact these appliance can have to improve patient care. Almost half of our patients at Riolo Orthodontic are treated using some sort of lingual appliance. At Riolo orthodontics we use Incognito, Harmony and SureSmile systems to treat our adult patients so that no one knows they are even wearing braces! Dr Chris Riolo presenting at the 2018 AAO meeting in Washington DC.. Dr Riolo presented on Lingual technique and the use of custom orthodontic appliances to improve patient care.